Daily Illuminator: Take To The Stars, With GURPS! June 7, 2015: Take To The Stars, With GURPS! What's the point of having an awesome spaceship if you don't go somewhere cool with it? 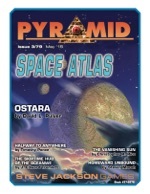 The newly released Pyramid #3/79: Space Atlas answers this burning question with new worlds and new options for how to get there. It features a new colony world from GURPS Ultra-Tech co-author David L. Pulver. Populated with former Earth troublemakers who are now . . . changed thanks to a psionic-inducing plague, this location comes complete with history, complications, and GURPS stats for its dangerous flora and fauna. This issue also includes two other locations of interest. One is a solar system that ensnares spacecraft and houses the enigmatic Quicksilver-Born (including a GURPS template and new alternate advantage for them), while the other showcases a curious alien race with an odd relationship to time that can benefit inquisitive heroes. For travelers among worlds who love hard science, this issue also delivers an in-depth look at generating realistic delta-V calculations. Fully compatible with GURPS Space and GURPS Spaceships, this feature will let you perform Hohmann transfers, gravity slingshots, and other possibilities as you move among worlds. But don't let the math scare you; the included bonus spreadsheet makes using its insight a breeze! And that's still not all the goodness contained within the cargo bay of Pyramid #3/79: Space Atlas! Science-fiction fans can download this issue separately, or subscribe today to keep amazing new developments arriving for your GURPS campaign for months to come!